Nobel day, December 10, 2017 began with the traditional Nobel Prize concert of Royal Stockholm Philharmonic Orchestra at Stockholm Concert Hall. 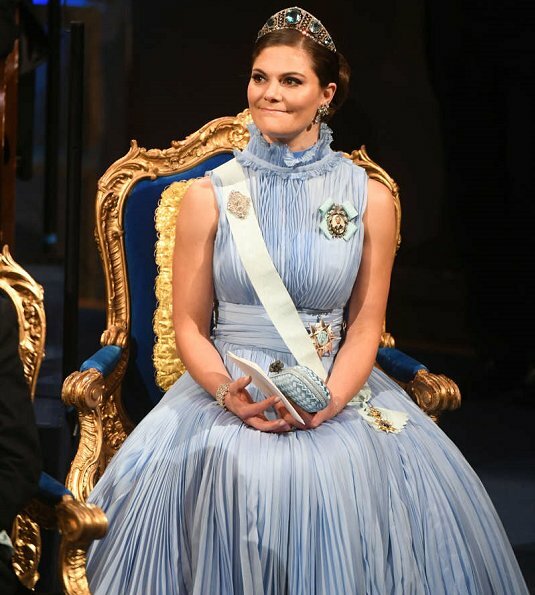 King Carl XVI Gustaf, Queen Silvia, Crown Princess Victoria, Prince Daniel, Prince Carl Philip, Princess Sofia, Princess Madeleine of Sweden, Christopher O'Neill and Princess Christina, Mrs. Magnuson attended 2017 Nobel Prize ceremony. Rainer Weiss, Barry C. Barish and Kip S. Thorne won 2017 Nobel Prize in Physics. Jacques Dubochet, Joachim Frank and Richard Henderson won 2017 Nobel Prize in Chemistry. Jeffrey C. Hall, Michael Rosbash and Michael W. Young won Nobel Prize in Medicine. Kazuo Ishiguro, an author and a scriptwriter who is of Japanese origin and a British citizen was deemed worthy of 2017 Nobel Prize in Literature. Princesses looks beautiful and I can 't choose one gown. They all look good, especially Victoria and Silvia! Wow! They look so good all. Victoria is wearing that Aquamarine Kokoshnik Tiara first time, her gown is suber and hair-do fine. Madeline and Sofia look good, Madeline can wear Amethyst Tiara best of the bunch and Sofia´s own tiara has new pearls on top. It seems to be really convertible one. Haven´t seen Princess Christina wear that Smaller Steelcut Tiara before. Nice to see her well enough to take part. Silvia looks good but little meh. 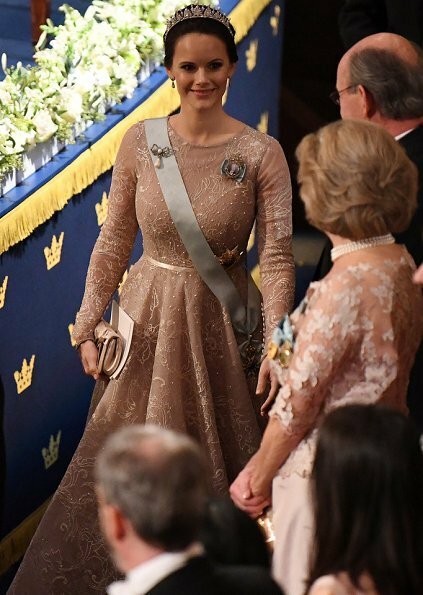 Crown princess Victoria outshine them all sorry but Victoria won this time but all of the princess looked beautiful encluding Madeline and Sofia . 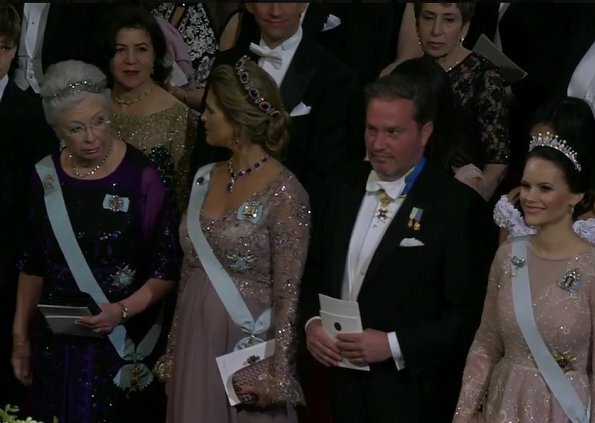 Prince Daniel looked handsome as always beautiful Nobel just stunning. Wow! Madeleine looks fantastic, perfection! Her hair, her dress...everything. She is gorgeous. I love when she is wearing this tiara, such a beauty, it suits her the best in my opinion. I also like Sofia's look. Like her dress, it's simple but elegant. I'm so glad she's wearing her wedding tiara and I love her hairstyle as well. Victoria is a bit too blue for me this time and I'm not a fan of this gown but I do love her hairstyle. As for Silvia, that dress is way too simple and not too elegant for a queen in my opinion. 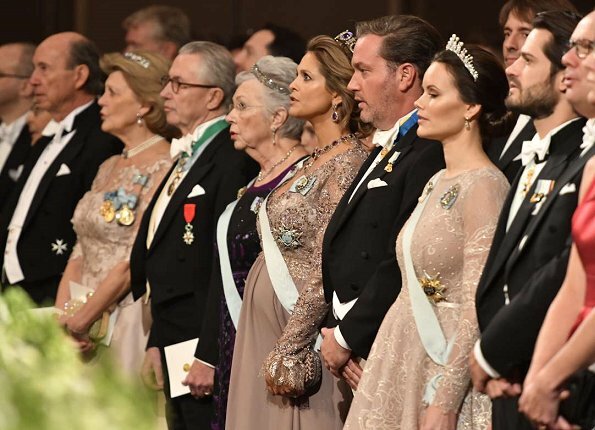 I agree that Queen Silvia is dressed more simply than the princesses in attendance. I wonder if Silvia has entered a stage in her life where she thinks less is more. In her prime, there was no one that could wear a ballgown better than her. I'm sorry I missed the museum exhibit of the dresses she previously wore to the Nobel ceremonies. I love the colour of Victoria's dress and everything from the waist down. I don't love the top - I can't stop staring at her bust! Finally a truly stunning look at Victoria! Bravo! The light blue is wondeful. 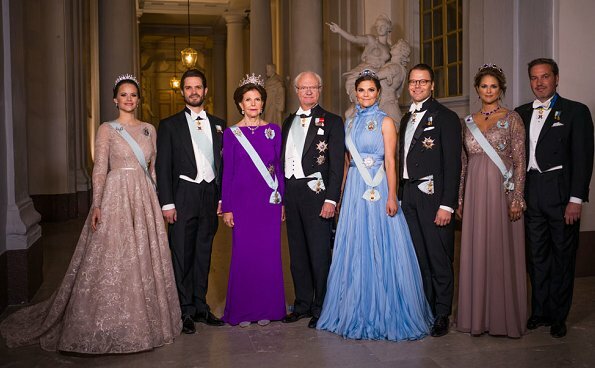 Queen Silvia's gown has wonderful color. Its simple but very elegant. Princess Madeleine...like her with the amethyst tiara, necklace, earrings and brooch. She looks so beautiful. 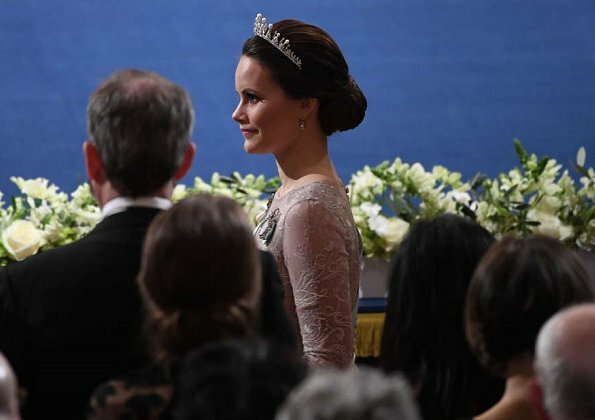 Princess Sofia -- I like her gown. Her hairstyle is a little flat but i like her tiara. In the last photo, Christina looks a lot like her brother, the king. Victoria was really shining tonight. They all look good, especially Madeleine, with her tiara and special young-mother-glow. She is such a beauty. Sofia and Madeleine look lovely in themselves. 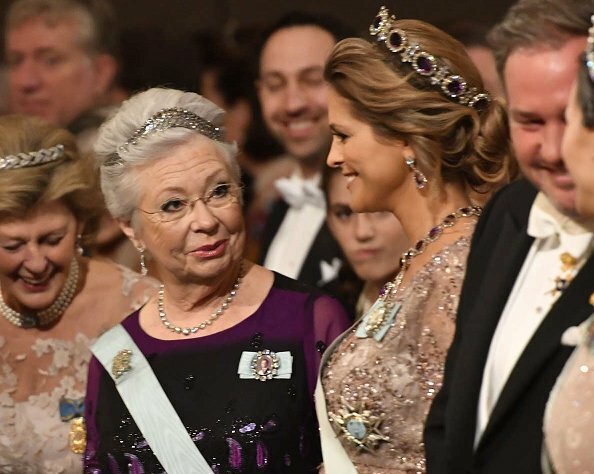 I really like the pearl addition to Sofia's tiara and I love that it is versatile and I have to agree that Madeleine seems to wear the Amethysts to their full advantage, however, both Sofia's and Madeleine's gowns while probably beautiful when examined up close and personal look "blergh" in the photos to me, they are non-specific in colour. I like more defined colour, not one much for murky neutrals or what some might try to call a pastel. What on earth Victoria was thinking by wearing this evening gown?? Okay, the color looks nice but the material looks cheap and this kind of style makes her breast look like melons. Very tacky and cheap for the Nobel awards ceremony in my opinion. And this tiara looks better on Madeleine. 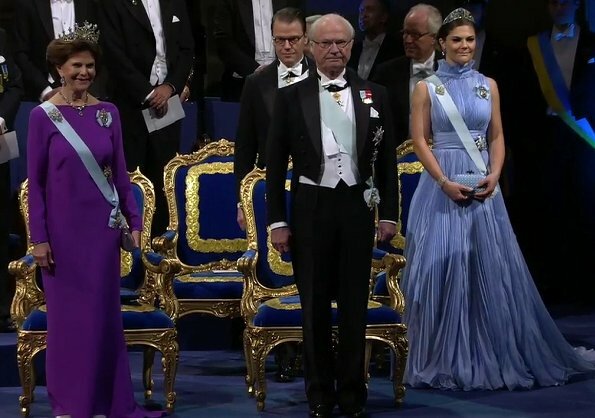 Compared to Victoria Queen Silvia looked simple but regal in her elegant purple dress. Less is more! Madeleine is one beautiful woman and she wears the amethyst tiara so well. Also liked her gown. Sofia looked also beautiful. Liked her new version of the tiara. Although Madeline looks beautiful, I find her style a little too much. Sofía looks pretty as well, but nothing special. Now, Victoria looks fantastic, a very femenine dress classic and yet very actual, different from the others, regal, but not overdone. Same goes for the queen, fantastic color and silohuette, in this case less is definitely more. Silvia - the style and colour of the dress really suit her but a richer material would have made it even better. Sofia - looks lovely in that beautiful dress. Princessy yet still elegant! Victoria - I don't understand the praise for this dress. It's a colour for a nightdress, and that silly collar is all wrong for her scraped back hairstyle. Overall it makes her chest look huge and her head look small. Maybe the color choice has something to do that they neighbour country Finland, my country, got to be 100 years old four days earlier. That "nightdress blue" happens to be very near our country´s flag blue and actually very sensitive thing to us. I am very sure Victoria knows it. If that's her reason for choosing the blue then fine, but she shouldn't have chosen a nightdressy type of fabric and pleated style which added to the effect. Wow! Definitely a royal family at a special (state?) occasion. The ladies all look lovely, the gowns are all great. Everyone's monitor is different, from here Sofia's and Madeleine's gown look like a neutral; probably called champagne in gowns, or sand in ready-to-wear. I've looked through previous posts. These ladies choose elegant maternity gowns, with the fabric draped beautifully over the baby. Such good examples. Victoria's gown looks better from one angle than the other, yes. I have to agree, effort was spent so that Madeleine looks perfect. Sofia looks lovely, too.